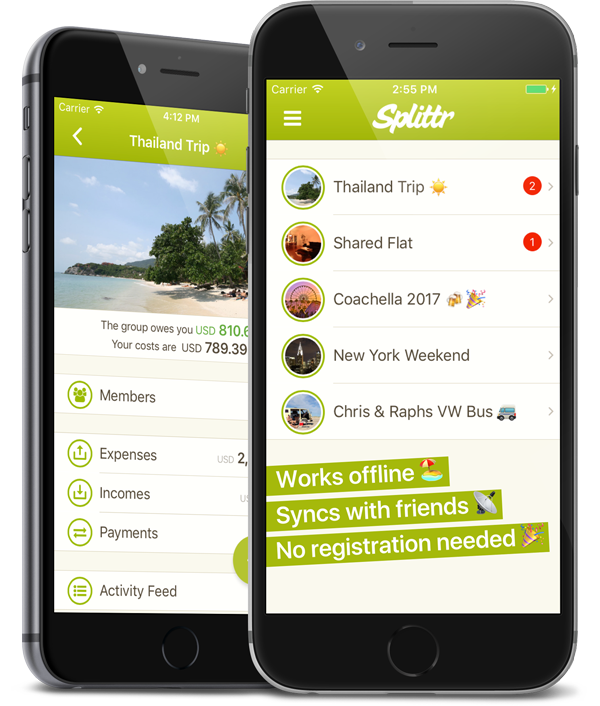 Splittr helps you to split group expenses and is super easy to use. It's perfect for vacations, weekend trips, for household costs or any other group costs. Simply add expenses as you go and Splittr will tell you who is next to pay and who owes whom how much. Invite your friends and everybody can enter expenses. - It's FREE to download! This is big time saver! After a monster trip with over 200 entangled expenses among 7 people, I spent 2 days sorting things out, accounting by hand, and preparing an expense report. Then I thought "there must be an easier way!" I discovered this app. In 15 minutes of data entry, this app produced the same results it took me days to get! I was proud of my arithmetic, but I'd rather save the time! Just toured Italy with 6 couples. Got home and what did everyone say was the best part, not the wine... Splittr was the best part of the trip. Wouldn't travel in a group without it ever again. Great app, thanks!!!! Wow! I've needed this for years! 7 college friends get together for a long weekend every year in a different city. We usually have to create a complicated spreadsheet at the end of the weekend to figure out who owes who how much. This worked PERFECTLY!! Bravo bravo! I love this app! It has totally revolutionized the way I travel with my family. I know this is probably an uncommon problem but when we travel my father insists on paying for everything for everyone which drives my poor mother crazy. Now we can all just let him produce his credit card and pay while we smile and enter everything into splittr. Then we even it up later. Thank you SO much splittr!! Highly recommend! Best cost split app after several similar apps trials. Never regret buying this app! Good job. I found this in preparation for a weekend away with two friends from college. It was simple to use but allowed us to break everything down and in produced a report of who owed who what! It couldn't have made paying for everything easier! I highly recommend this app. This app makes splitting trip expenses a breeze and takes all the stress out of evening up at the end. I've used this on several trips and the group is always grateful for this awesome tool. I love this app! It's very straightforward and easy to use. It's especially good when expenses are not the same for everyone in the group. I have used this to calculate who owes what for a roadtrip and I LOVE it!! I was trying to use Excel and it was a pain! Glad I found this just a few days in. It'll also be used when figuring out paying for gifts and such with coworkers! First app I've ever written a review for. Super cool and very versatile. Used on a vacation with friends ... I'm the hero. Very convenient way to keep all your friends from hating each other after a trip! Does the math for you so you can focus on having a good time. I can't say enough good things about this app. Made figuring cost sharing among three friends traveling in Italy a snap. Super easy to figure out, great reporting, does everything you need it to. This is exactly what I needed for a road trip with my friends! Very slick nice app! Does everything VERY well. Travelled with friends to different countries thus different currencies. No problem as the app not only handled the splits of the costs but converted them to the home currency which made the final equalization payments a breeze once we got home. Brilliant. Fantastic! Well worth the cost! This is a fantastic app! I used it while away with a group of 9 women, and I can't think of a single scenario that it couldn't easily deal with. I can't make any recommendations for improvement because it's already completely functional and flexible. My friends all want the app now! Three of travel a lot together. We all take turns paying for various things. This app is perfect for keeping everything sorted out and is soooo easy to use. Great reports. Must have for multiple travellers!!! Just got back from trip with two other friends. Put in all receipts, split costs between two or three people, equally or unequally depending on expense. It is so easy to use, love the equalization report - makes it so clear as to who owes whom what! If you travel with one or more other people you need this app!